OUTSTANDING Ofsted grading in all areas. My name is Sally Eaton and I live in Maulden with my partner and 21 year old daughter who have been dbs checked. I have been working as a childminder for 18 years and love working with children. 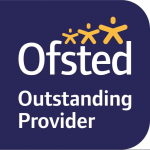 I have been rated Outstanding by Ofsted and have an NVQ3 in childcare. I regularly attend courses to keep me updated in all aspects of looking after children. I have a large playroom with toys that cater for all ages and a safe, enclosed garden with play equipment. I plan and organise activities to ensure that every child receives an enjoyable and challenging learning and development experience that is tailored to meet their individual needs. We have fun at Toddler Groups, parks, for walks, outings to farms, indoor soft play areas, and at home they have great fun with a large variety of toys and craft activities. I am flexible around meal/ sleep times and planned activities. My home is a happy, safe and warm environment where the children are well cared and stimulated. I also aim to meet the individual needs of each child. Children are encouraged, assisted and supported to learn and develop. I follow standards set by Early Years Foundation Stage for this and the children become confident, self assured, a skilful communicator and competent learner. I have a good relationship with both the children and parents and feel that communication with them is very important to ensure that the parents are happy with the child care and leave their child with me feeling assured that he/she is well cared for and happy. I have been working as a childminder for 18 years looking after babies from the age of 3 months, toddlers and school aged children. I also have experience looking after children with additional needs. I am NVQ3 qualified and accept funding for two, three and four year old children. I attend courses regularly to ensure that I have good knowledge in all areas of my work. I feel I am priviledged to be able to work with children and love seeing them grow to become confident and self-assured. Below are the latest reviews for Sally Eaton. Please note that reviews represent the subjective opinions of other Childcare.co.uk users and not of Childcare.co.uk. Parents must carry out their own checks and references on childcare providers to ensure that they are completely happy before enaging in the use of their services. My children have been with Sally now for over 2 years and they still look forward to going to her each day. Sally is a very fun and bubbly lady and I can see by the smiles on my kids faces when I pick them up and drop them off that they love being with her. My little boy was very slow with learning and as much as I try to help him I don't get the most alert time in the day oh week days to help him so I thought he would be very behind when he goes to school but I just accepted it and help him when I was at home. However, Sally has put time and effort into going out of her way to give Riley extra help through his struggling and he is now exceeding other children that were ahead of him. He has come so far and I know without Sally's help and commitment it wouldn't have been achievable so soon. Also Sally barely ever stays in with the children she minds, they are always off to toddler groups, the zoo, play areas etc. with absolutely no extra charge to the patent. There is never a dull day for the children and the time they do spend at Sally's she has a lovely big play room and a huge arts and crafts stash so the children are always having fun. Thank you so much for the lovely review. Working with you to progress your son's development has worked so well. He is keen to learn and I enjoy encouraging and assisting him. We often go out in the mornings and play in the playroom and do craft activities after lunch if a child is not sleeping. If however a child would prefer to stay in then we have a fun filled day at home. Great fun and homely environment ! Sally has been my 4 year old's childminder for the last 3 months. He's progressed so well with his writing and also confidence playing with other children since he's been with her. He really enjoys spending time at Sally's house. He always has stories of all the fun things they've done, including where they've been. Sally always makes sure they go out during the day but also some quiet time at home. She has a fantastic garden with toys and equipment and also a well equipped playroom. The whole family love spending time with the children, chatting to them etc. I can always trust that he'll be well looked after with Sally. She's a very caring lady and is there for him when he gets upset, but is also no nonsense .. she's instilled some great rules, especially table manners and also being more independent (like putting shoes on himself). The children Sally looks after are all well behaved and are a credit to her. I cannot thank Sally enough and I would recommend her to anyone looking for a home from home childcare provider. I could not have made a better choice than Sally as a childminder. My daughter in her care has become confident, self assured, a skilful communicator and a competent learner. Every day she loved going to meet her friends, knowing that she was entering a safe, warm environment. Sally also encourages the children to play well together and behave appropriately. She organises stimulating activities both inside and out and does regular trips to toddler groups, farm, parks and library. I would not hesitate to recommend her.